My Tour de Fleece spinning project for challenge day (July 22) was to create a tail spun yarn. The extra component to the challenge is that I would be spinning this in public at a little spinning rendezvous with some of the local TDF Team of Wonder. Here's my finished skein, all plied and ready for a project. For those not completely familiar with art yarn spinning, tail spun is the technique of adding long locks, spinning only the base (cut end) into your single, leaving the curly tail dangling like fringe. With this spin, in addition to the tails of curly wool locks (Teeswater) I also incorporated whole locks into the body of the yarn, in other words the majority of the length of the lock is spun into the single, giving you gorgeous curly lumps and bumps and little stray pops of curl running along the single. I hope you have a delightful and creative weekend! I've been plugging away at my Tour De Fleece goals which were to work on blending alpaca with various fibers and also to process and spin Suri alpaca. I've really enjoyed working on both goals. I have to confess I have several projects going on, this is unusual for me. I typically work on 1-2 projects steadily until they're complete. This week I pulled out an old UFO, a crocheted afghan I started eons ago. Done...my Mum already claimed it. Then I decided I liked the crochet stitch so well, that I'm working up a scarf. In addition to that I am in the home stretch of finishing a special woven project. And if that wasn't enough, I pulled out the gesso, got my surface prepped and started a new oil painting. See what I mean, I'm really bouncing around creatively. In the spinning department, I've been plying some of my TDF spins. 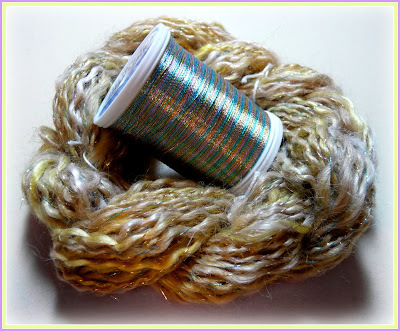 I'm still mulling over the gold bobbin pictured above, I did a little test ply using a really pretty metallic thread from sulky. I need to live with it a bit to determine if it's the right finish for this single. That's ok, plenty of other bobbins are waiting to be plied! I hope you are keeping cool, have a wonderful weekend! Here's a little peek at some of the fiber goodies I have been working on this week. The TDF rolls on, and I have been spinning away, however I feel like I am neglecting my other fibery interests, so I squeezed in a little work on some non-spinning projects too. I finished up the HailDust and GoldDust bobbins, I plan on thread plying them with metallic thread. 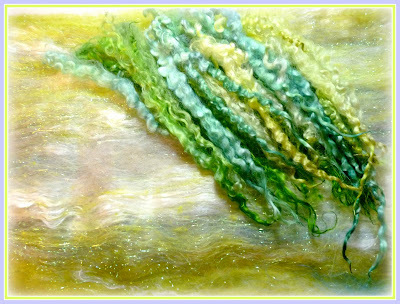 I spun up some small skeins of coil yarn to use in a felting project, you can see the start of it there in the center. I was inspired by Heather Woollove's posts showing the technique she uses for felting her lovely purses. 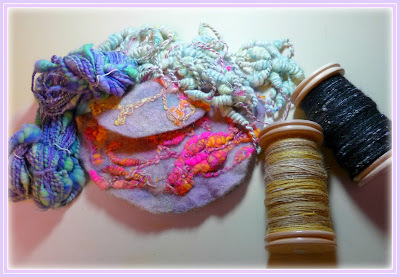 I wanted to try my hand at this technique while making a new felted bag for my spinning wheel, incorporating some of my coiled art yarn. I need to do some needle work to embellish my new little bag before it is truly finished. I have to thank Ms.Woollove for her excellent and inspiring posts. I hope everyone has a delightful weekend! Blessings Friends! For the first time, not only did I signed up for the Tour de Fleece, I am actually spinning! 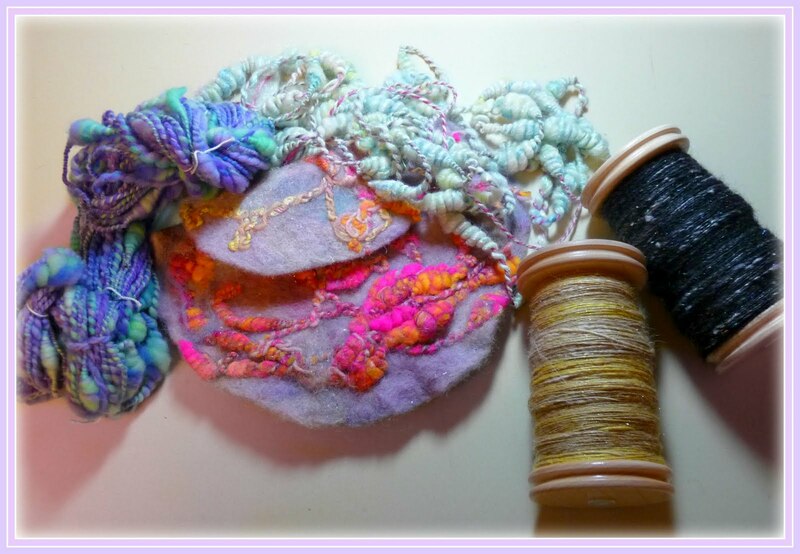 I've really enjoyed all the beautiful yarn pictures being posted this week in the Wonder Why Alpaca Ravelry group, pop over and check out all the inspiring spinning going on! Rather than re-post photos of all the yarn I've already spun, I thought I'd share what I've been whipping up for upcoming spins. The photo (which really doesn't do the fiber justice) above shows a pretty golden blend of Suri Alpaca from Princess (light fawn, my fav!) 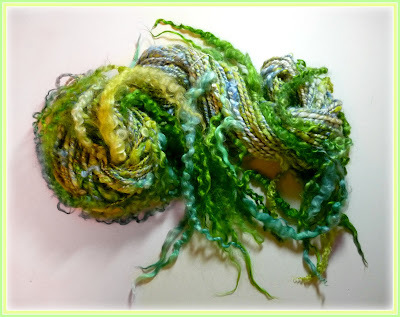 this gorgeous fiber came from Melissa over at Needle and Wheel Designs. 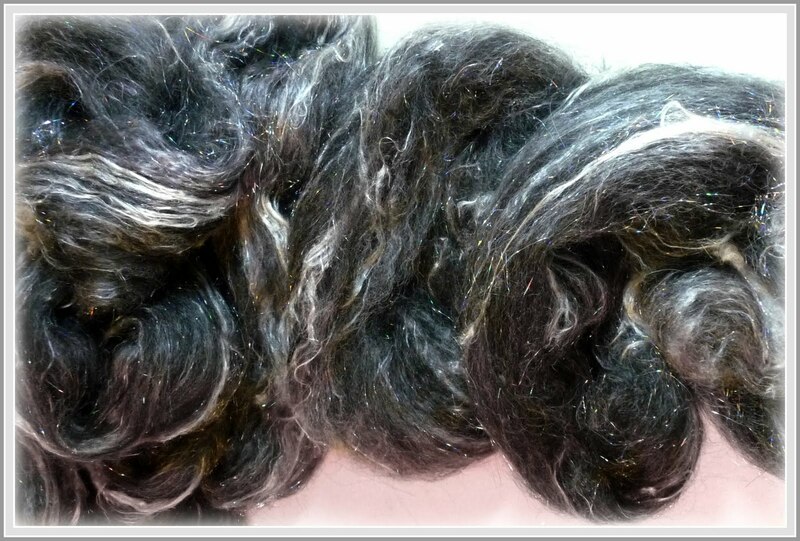 this was the first time I've worked with raw Suri fleece, processing it from start to finish. I really enjoy getting to know a new type of fiber. Along with Princesses fiber, I included Finn Sheep, Coopworth, Bamboo and Silk top, all dyed in shades of gold, oh yeah, I had to sprinkle in some gold Angelina too, you know how I love sparkle! This is also Suri from Needle and Wheel Designs, John Cash's scrumptious jet black fiber was blended with Silk Top, Mohair and Coopworth all dyed in shades of silver and of course I added black and silver holo angelina. I'm getting ready for a little tail spinning using my favorite shades of green and blue green. Fun, fun! And last but definitely not least Is the gorgeous rose colored Suri/Merino fiber I bought from Wonder Why Gal! I've already spun this, I couldn't wait...it's pink! I blended Andrea's lovely fiber with some of my favorites all dyed in shades of pink. It took a while to spin, because I wanted to do a nice lace weight single, and because I didn't have nearly the time I would have liked to spend with my wheel. I'm really excited to get spinning on these blends, really excited! I hope you have a wonderful weekend! Blessings Friends! 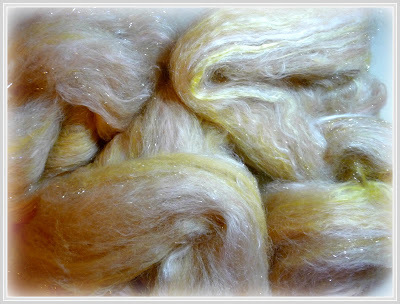 I picked up this wonderful Pink Lemonade Fiber Art batt from Kelly at Felting Sunshine back in May. 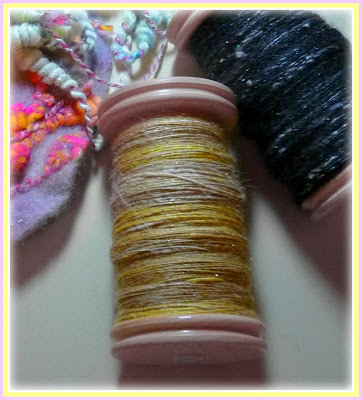 It's really gorgeous and chuck full of lots of soft and sparkly pink fibers, my favorite combination! I just love pink, that batt had my name all over it! 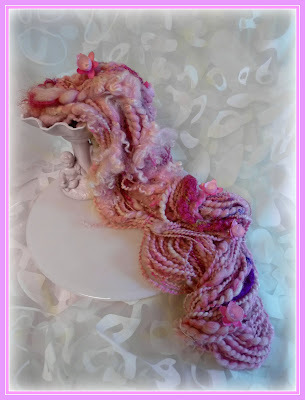 Along with the batt from Felting Sunshine, I spun in generous clouds of my Petal Pink Lamb Locks and Sari Silk Tangles, Plus the pink daffodils I made special just for this spin. The skein is 82 yards, 5.25 ounces and Super Bulky 5-6 wpi. It was a really fun spin and I think the daffodils are right at home in this yarn. Be sure to check out Felting Sunshine for some gorgeous fiber and pop over to Wonder Why and Natural Suburbia to see what all the creative people have been up to this week! Have a wonderful and safe holiday weekend! Blessings Friends!